All listed recreational rides are free and open to the public. We offer a full monthly schedule of mountain bike rides for all skill levels. Mountain bike rides are organized by CORBA member clubs and lead by experienced and knowledgeable guides. Recreational rides are a fun and social way to experience a variety of trails in Los Angeles and Ventura counties, and beyond. View the photo gallery of the Recreational Rides! 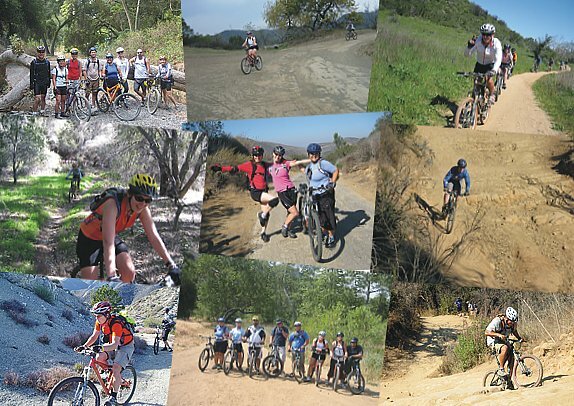 Weekend mountain biking destinations include in the Santa Monica Mountains, Palos Verdes, the San Gabriel Mountains, Verdugo’s, Tehachapi’s, Simi Valley and Orange County. Most rides are a short drive from Los Angeles and Ventura communities including the South Bay / Manhattan Beach, San Fernando Valley, Pasadena, Burbank, Agoura, Westlake Village and Camarillo. Also included are weekday and evening rides throughout the area, and extended trips to locations throughout the Western USA. For beginning mountain bikers, we include dedicated novice rides in our schedule from time-to-time. We also recommend taking advantage of our free mountain biking skills clinics. View our full ride calendar here. How our ride calendar works: CORBA member clubs post rides on the calendar including the meeting time, location and directions. Also included is information about the ride routes, terrain, skill and endurance levels, and other pertinent information about each ride. Note that different clubs have different systems of rating the skill and endurance levels for each trail. Links to their websites are located at the top of the Calendar for further information. Check the ride description beforehand to see if it's necessary to give the ride leader advance notice of your attendence. Please print, sign and bring our waiver to your first ride. Helmets are required. More About CORBA’s Recreational Rides Calendar: CORBA’s ride calendar serves as a resource for mountain bikers of all levels to find groups to ride with and explore the area's trails. The calendar also provides a central location for local clubs to post rides. Experienced and skilled guides lead the rides in variety of locations and terrain types, and educate riders about trail etiquette and appropriate trail use, and cross country biking skills.